Upon entering the center, I was greeted as I normally am by Janie and a number of frequent visitors and student workers at the Center. Immediately, I felt a sense of community and pride as I ventured into the multi-purpose room and chose my seat prior to the beginning of the ceremony. 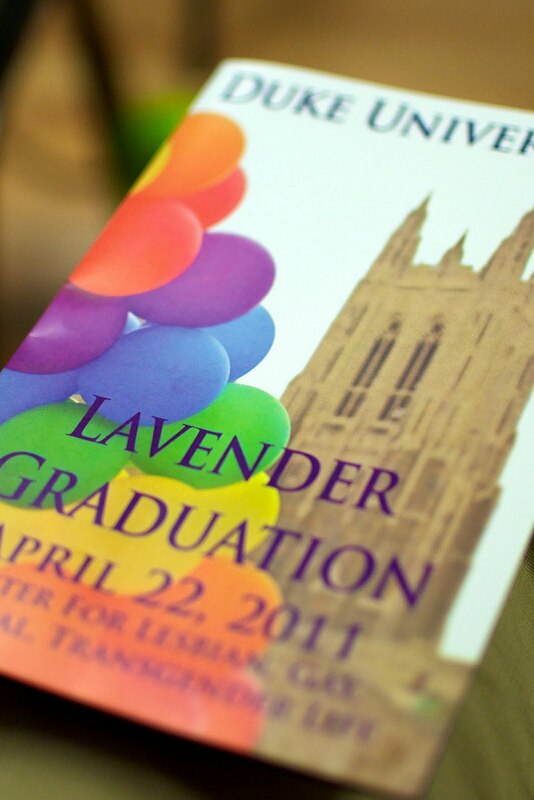 I had never attended a Lavender Graduation before so I had no idea what to expect. Based on my experience, I’m certain that I made the right decision to go this year. To see the family members and faculty that were in attendance was a testament to the all of the support and unity that the Center promotes. If never I had felt comfortable in the Center before, today was the day that I felt I truly belonged. As parting words and quotes were shared, certificates and rainbow tassels distributed, inspiring and encouraging words spoken, tears shed, and hugs given, there was an undeniable sense of love in the air. I was privileged to be in the room at that time and I am anxiously awaiting my senior celebration with the LGBTQ. As a first timer, it was truly an honor to share my experience with the class of 2011. There are many members of the senior class that have contributed to my undergraduate career here and I will miss their presence on campus dearly in the upcoming school year.